Voices of concern grow louder over the ever-rightward rush of Japanese politics with such things like the visits to the Yasukuni Shrine, sending the Japanese Self Defense Force to Iraq, territorial disputes with China, and the never-ending sense of hostility toward North Korea. Not all Japanese politicians are like this, however. Even former Liberal Democratic Party (LDP) chief Nonaka Hiromu had clearly opposed visits to the Yasukuni Shrine, a major source of controversy. Rep. Kono Taro, counted among the new generation of LDP leaders, is presenting a rational alternative to the Yasukuni Shrine visits. In a recent exclusive interview with OhmyNews, he presented his three principles of liquidating the past, facing reality and looking toward the future. The one-hour interview took place at Kono's office in the Japanese House of Representatives on Sept. 14 -- Ed. Rep. Kono Taro's office, where the interview took place. In the back is a campaign poster from Rep. Lee Seong Gwon. In June 2003, President Roh Moo Hyun visited Japan. As the first foreign visit following Roh's becoming president, it was supposed to be mostly symbolic and ceremonial, but several practical agreements were unexpectedly concluded during the trip. Typical among them was the opening of direct air service between Gimpo and Haneda, and the extension of short-term residence visas in Japan to three months. The man who proposed the Gimpo-Haneda route was 41-year-old Rep. Kono Taro, famous for being a representative member of the LDP's pro-Korean faction. Kono is now pushing for an agreement for visa exemptions between Korea and Japan. Seeing how he's the only lawmaker in Japan who runs a Korean-language homepage and how he actively makes use of intern visas for Koreans, one wonders if perhaps he might be a Korean-Japanese. His father, however, is Rep. Kono Yohei, a major figure in Japanese politics who once served as LDP general secretary and vice prime minister. 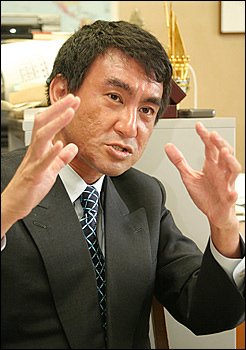 Kono Taro, too, said of himself, "I'm part of the strongly conservative LDP, and I think of myself as a conservative." However, he added, "We need a Asia-centric policy that considers at the same time Japan's national interests and the interests of surrounding nations, and the focus of that is between Japan and Korea." Compared to most other LDP lawmakers who place importance on Japan's relationship with the United States, Kono stands out because of this Asia-centrism. About the visits to the Yasukuni Shrine, which has drawn criticism from surrounding nations like South Korea, North Korea and China, Kono said, "I, too, pray at the Yasukuni Shrine as I have relatives buried there, but I think the shrine itself is a problem... I think if we established a third facility free from political connections and enshrined the war dead there after separating out the war criminals, the controversy would disappear." With this, he revealed what differentiates him from other LDP lawmakers. 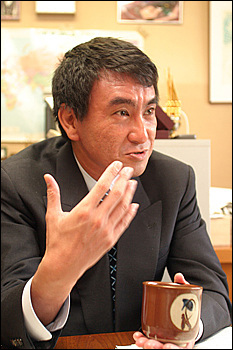 Kono is considered one of the leading younger politicians to possibly follow Koizumi as prime minister. A man who despite being an LDP lawmaker is making a name for himself for his Asia-centric diplomacy, focusing on Korea-Japan relations and his presentation of a rational alternative to the Yasukuni Shrine visits, Kono met with OhmyNews. OMN: You've become known as an exceptionally dutiful son for donating last year part of your own liver to your father, Rep. Kono Yohei, who grew gravely ill due to hepatitis C.
Kono Taro: "My father is a fairly stubborn man, so it just took some time to convince him; I didn't do it out any particular feeling of filial piety. And I wasn't the first person to do something like this, either. I was just suspicious as to what level Japan was at in terms of organ transplants, but when I looked at the figures, I found the level to be quite high, with 439 conducted last year, so I decided on the transplant. I wasn't craving for media attention or anything like that. I simply thought my father was ill and I had to give him part of my healthy liver. Now, we're both healthy. Anyway, I'm critical of the way the mass media has handled this, praising it as filial piety and a rare act." You're famous for exerting efforts to improve the Korea-Japan relationship by conducting exchanges with young Korean lawmakers and running your homepage in Korean. What made you focus on improving the Korea-Japan relationship? "It comes from a sense of urgency. I understand the problem as one in which Korea and Japan must pool their strength so that they might survive in the changing global environment. As the European Union enlarges, it's expanding its market gradually toward East Asia and China -- a nation with a population approaching 1.5 billion and immense production capacity expanding its influence throughout the world. The U.S. is confronting this through NAFTA. India, too, will be using its own initiative. One wonders what Japan and Korea should do in a situation like this, and I think the two must combine their strengths to compete against the other super economic blocks. Afterwards, we should bring Southeast Asia into this economic group. To do this, we should quickly resolve practical issues like signing a free trade agreement, visa exemptions and freeing up labor." "It's a question of utility. During the World Cup, short-term visas were temporarily extended from 15 days to three months. They are currently set at three months. However, the World Expo will be held in Aichi Prefecture next year as well. And normally, thousands of people travel between Korea and Japan every day. The very existence of visas decreases efficiency. The Gimpo-Haneda route was the same story. Narita and Incheon airports are located far outside the city centers. If the economic exchanges I mentioned before are important, business efficiency also becomes important, so we must cut the time off of air and land travel. I think it would be strange to say visa exemptions wouldn't work." Are you personally satisfied with the results in these practical matters? "No, I'm not. Direct air service between Gimpo and Haneda was opened, but the current flight schedule isn't so good. I understand there are three flights, one in the morning, noon and afternoon. These are the worst schedules for business people. Rather, if they set the flights at 7 or 8 in the morning and 9 at night, it would make business possible, but why they don't do this is the question. And the cumbersome immigration procedures are a problem. We need a system by which if you are cleared to depart from Haneda, you don't need to go through immigration at Gimpo. Of course, the same goes for immigration at Haneda. The travelers have to pass through each nation's immigration on even the Haneda-Gimpo route, which is only thrice daily. If any party were more accommodating, we could cut at least one hour off immigration screening time." It might be more convenient for passengers, but the immigration laws between the two nations are different, so is this possible? "We need a change in thinking. And in fact, Malaysia and Singapore are doing this. They have a special passport, which they accept as identification between the two nations. If you just show it at the airport, they let you in. It's a similar idea to what one uses on domestic lines. If one needs to enact special laws, this is entirely possible. Japan and Korea is so close -- and the Seoul-Tokyo line is closer than the Busan-Seoul or Osaka-Tokyo routes -- that they should be more accommodating rather than stubbornly clinging to an outdated immigration system." "The enshrining of war criminals in the Yasukuni Shrine is a major question." I know you made Lee Seong Gwon, who is now a lawmaker [with the Grand National Party], a secretary, and you've made a Korean student doing his Ph.D. work at Keio University an intern secretary. I understand you're the first Japanese politician to make Koreans secretaries. How has that been? "To improve the Korean-Japanese relationship and build amity with Korea, the most essential thing is to understand Korea and Lee Seong Gwon helped me quite a bit in this regard, and he was extremely sincere. After him, Mr. Choe has been helping me with pending international issues, especially the relationship with Korea, with which he's been extremely helpful. 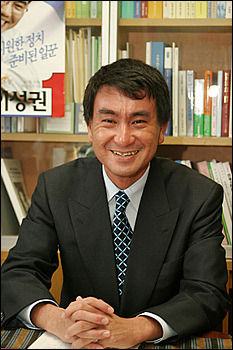 I've met Lee Seong Gwon since he's become a lawmaker. I, too, felt a big sense of reward. Besides myself, there are four or five other lawmakers that have Korean secretaries, but because mine could share more direct and substantive discussions with the papers and mass media, it's lent quite a bit of strength." What kind of discussions, for example? "The Yasukuni Shrine, how they view North Korea, and so on. This is because how they see those issues differs from the way the Japanese mass media see them. In the case of the Yasukuni Shrine, listening directly to the position of those from nations victimized during the war gives one plenty to think about." What do you think about Japanese politicians like Prime Minister Koizumi Junichiro visiting the Yasukuni Shrine? "Because I, too, have relatives who died during the Pacific War, I pray at the Yasukuni Shrine. I have sizable doubts, however, about enshrining war criminals at the shrine. Isn't this a cause for diplomatic disputes every year? If we were to build a third facility and enshrine the pure victims of the Pacific War and war criminals separately, wouldn't the cause of the dispute disappear? There is a tendency, however, for opinions in China and Korea to become over-emotional. If one simply hates the Yasukuni Shrine for whatever reason and unconditionally condemns prayers there, dialogue will not progress. If there's a problem, isn't it the order of things to discuss specifics in order to solve the problem? It's doubtful whether desired improvement in the Korea-Japan relationship would be possible without liquidation of the long overdue issues such as the Yasukuni Shrine, Korean victims of the atomic bombing and the comfort women. "Of course. In particular, the response of the Japanese government toward the victims of the atomic bombings has been frankly pitiful. The comfort women issue, too. All the government does is unconditionally hang on government principles with no concrete plan at all to resolve these issues. If the victims continue to protest with their all, while the Japanese government remains flatly silent about those protests, we'll simply continue along perpetual parallel lines. It's important for the Japanese government to consider and understand the position of the victims. The impression left by Koreans that the Korea-Japan relationship could not move forward at all unless the history was liquidated seems quite strong, and I hope they understand that even if historical issues remain, if the two don't join hands quickly, they will be weeded out from the world. We should not neglect the past, but we should not close eyes to the future, either." I want to hear more about your future political ambitions. "Hmm, that's secret (laughter). About two years from now, Prime Minister Koizumi will step down. After Koizumi, LDP General Secretary would be Abe Shinzo's generation most definitely. This is because it's clear as daylight that if Abe's generation doesn't step up to the fore, the LDP will lose to the Democratic Party. If this is the case, couldn't we condense to a question of either Abe or me? As the younger generation, if we give the LDP international competitiveness with ambition and a rational view, I think we could get good results." The Japanese mass media has been quite sensational about the controversy surrounding South Korean nuclear experiment suspicions. What do you think about the reports of Korea's nuclear experiments? "Personally, I think there's a slight problem with the nuclear tests themselves. Even if one says the scientists extracted plutonium out of their own personal interest, it's going to be shocking to Japan, which has experienced atomic bombings. Moreover, with the six-way talks going on, the reports came out at the worst of times. I want to point out that it seems like a lack of administration on the part of Seoul. Yet it's also strange that Japan caused much more noise than was really necessary. This is because Japan, too, has 37 tons of plutonium. It's shameful that Japan should cause so much fuss when South Korea or North Korea reprocesses just a few milligrams. The Japanese government and media say that our plutonium is for energy development so there's no problem, but actually, it has 37 tons, a massive amount. Officially, we say we aren't using it for nuclear fuel, but if we don't use it up, we don't know what may become of it in the future. I think it's inappropriate for Japan to debate about the uranium and plutonium of other nations." "During the World Cup, I was moved by the Red Devils' 'Let's Go Together' banner." I understand you also have a great interest in sports. In particular, I heard you're a football expert, and that through football, you came to have an interest in friendly ties between Korea and Japan. "I first became interested in Korea for the simple reason that it's geographically close (laughter). However, I came to think of Korea as a nice country watching the Korea-Japan match during the 1997 France World Cup Asian qualifiers. I also run the Bellmare Hiratsuka J-League football club, for whom Hong Myung Bo and Nakata Hidetoshi used to play, so I do consider myself a football fanatic. It was the 1997 Korea-Japan World Cup Asian qualifier match. The place was Seoul Jamsil Stadium. Korea had already earned a spot in the finals, and Japan needed a win to earn a ticket to France. At the time, unexpectedly, I looked at the stands, and I saw the Red Devils had hung up a banner saying "Let's Go Together" and were cheering for both Korea and Japan. I was so moved I cried. In fact, wouldn't other Japanese who had experienced that feel the same thing?" In your parliamentary activity, what are you placing most interest in? "A basic bill has been written for a Korea-Japan visa exemption agreement, and I have been working hard to set the table to ensure that a free trade agreement goes smoothly. I have also been working on bringing to fruition a Korea-Japan football league and reducing the aforementioned inconveniences of the Haneda-Gimpo line. Of course, with issues like liquidating past history and the Yasukuni Shrine visits, I'm going to consider the positions of the people of countries victimized during the war, including Korea. The most important thing is an attitude to approach in a balanced way three themes -- liquidating the past, confronting reality and orienting oneself to the future. More than a hard and fast principle, this is something to promote a movement that could be flexible according to the situation. I'm going to work hard for this in the future as well. We thank you for agreeing to this long interview. We ask you to say something to OhmyNews' readers. "Just by disposition, I'm a conservative politician, and OhmyNews is a progressive media outlet, but I feel it's worthwhile that we could meet and talk naturally. Rather than unconditionally refusing to meet one another -- just because you think the other side will be a bad dialogue partner or have preconceived notions of what you say even if you do meet -- if we meet and talk like this, I think we can find common points and solutions. I would like the chance to meet with Korean young people and hear their thoughts and opinions, should the opportunity arise. I really hope that chance comes." 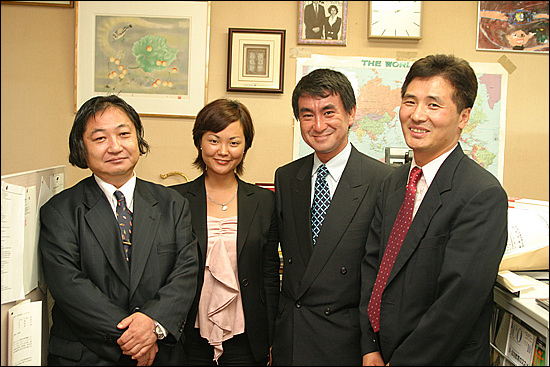 A photo with the interview team. Rep. Kono ended the interview by expressing hope that we could meet and talk often in the future.